Welcome to week 2 of the One Room Challenge. If you’re new to my blog, welcome. 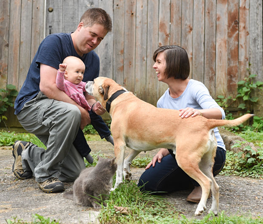 My name is Julia, and I live on a 129-acre farm in Ontario with my husband, Matt, our one year old daughter, Ellie, our rescue dog, Baxter, and #theworldsbestbarncat, Ralph. We moved here 7 years ago, and since then we’ve been working on our fixer-upper 1970s era ranch style house with lots of DIY, thrifting and occasional professional help. Our style is a bit traditional and full of very personal elements, with country touches to make our house look like it belongs in its farm setting. The dining room is the last makeover before we start more major renovations like a garage addition, new kitchen or bathroom. In last week’s post, I shared my plans for this update. Today I thought I’d give more of an overview of this space. The dining room is a large room. A vaulted ceiling and a big archway to the living room make it feel even larger. Over the years, we’ve collected vintage and thrifted furniture that are perfect for our traditional style: Matt’s grandmother’s piano, an antique dining table, 8 chairs that turned out to be a pretty good match to the table, and after an incredibly lucky thrifting score 3 circa-1980s bookshelves/TV/entertainment units that stand in for our china cabinet. Like every room in our house, the dining room was rough–literally. The walls felt like sandpaper and the ceiling is popcorn. Add to that stains, scuffs, holes and cracks in the drywall and the trim, and the room was not pretty. It was also dark. Even with the large window, the dark brown walls make the room feel dim. Another issue arose this winter when one of the panes in the window cracked. It’s on my list to be fixed during this ORC. All of the furniture, except the piano, needs a makeover. The table and chairs need to be refinished. The chairs need new upholstery. And the china cabinet needs to leave the 80s behind for fresh white paint. Someday, I plan to cover the popcorn ceiling with planks. But for now, I’m going to be relying on the power of paint and focusing on the walls and hopefully the china cabinet. And with the motivation of the ORC, I’ve gotten off to a quick start on this project. I sanded the walls smooth and made so, so much dirty dust. Vacuuming has been the central task of this makeover thanks to the baby crawling around–and occasionally licking the floor (why?). And then I got started patching all of those holes and scuffs and cracks. I knew the walls were rough, but I hadn’t noticed how many cracks there were. More sanding, more patching, more sanding–and lots of vacuuming to try and keep the baby out of the dust. My other crew member, Baxter, was not helpful. He loves the morning sunbeam in the dining room and even the threat of 7 years bad luck from laying under the ladder wouldn’t keep him from his favourite napping spot. My luck seems to be good so far. One week in and the walls are smooth and ready for priming. The floor–and the baby–is relatively clean. Onward with the challenge. 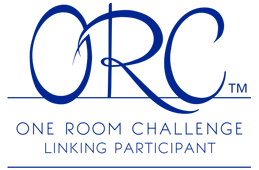 You can check out all of the ORC participants later this week. The designer participants share their updates on Wednesday and the guest participants will be posting on Thursday. Is anyone else dealing with rough walls or ceilings? How about battling dust? Who else has a helpful DIY crew? You are rocking and rolling! I love the high ceilings in your dining room. Thanks, Stacy. I’m looking forward to your update. The high ceilings are definitely a great feature. I look forward to seeing what color you pick for the dining room! And re: babies licking floors, our son was the same way with our tiled kitchen floor. We just couldn’t stop him! I figure it builds her immune system? And hopefully she’ll grow out of this someday! I hadn’t realized quite how large your dining room was. That archway is huge! You are going great guns with your prepping. We are working alongside you, painting our second bedroom so it will become my studio. It was a very lurid green, now it’s got at least one coat of primer on all of it. That picture of Bax is adorable. I can see why he loves that spot. Kudos on surviving your first week of painting-with-a-baby! That’s great that you’re working on one of your rooms too. It will be so nice to be able to set up your studio. That sunbeam is the best. When Ellie was first born, she, Bax and I spent a lot of time sitting in the dining room in the mornings soaking up the sun. Now, she loves that dog bed as much as he does and if he’s not around, she crawls onto it. You are off to a great start! All of that preparation is so tedious. Thanks, Sarah. The prep part takes the longest, but it makes such a difference. I’m redoing my (very small) entry hall for the ORC and I feel like the wall patching and sanding will never end, so I can’t even imagine a big room like your dining room!! Good luck with everything, I’m excited to see how your room progresses! It’s such a process, isn’t it? We spent 6 months drywalling our basement, which definitely felt unending. Patching now seems like NBD! I promise you’ll get there, even when it feels interminable. Thanks so much for your comment. Good luck on your makeover.